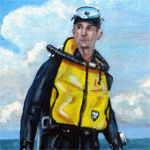 “My first dive was off the southern coast of Florida, not far from Clear Water Harbor. My husband was at the time engaged in the business of collecting rare shells and coral for several Northern Universities. I well remember how I felt when I first donned the armor. Fear and curiosity were so closely blended that I hardly know which I felt the most of. At any rate, my husband was waiting, and almost before I realized it the queer canvas armor had been adjusted and the breastplate had been slipped over my head. A thick pad or collar had been put on my shoulders to take the weight off the breastplate and helmet, which alone weigh 56 pounds; but even then the plate felt quite heavy, and as the metal gaskets were being screwed down with thumb-nuts and a wrench, I felt as if I were being screwed up in my coffin. But there was little time for such gruesome reflections, and a stout leather belt holding the sub-marine knife was next girded about my waist..."
I love it when I can find historical pieces like this of totally kick-@$$ women!